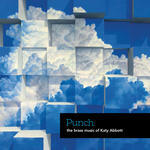 Punch / the brass music of Katy Abbott. UndercurrenT II : trumpet, trombone, electric guitar and loop pedals [eScore] / Katy Abbott. UndercurrenT II : trumpet, trombone, electric guitar and loop pedals / Katy Abbott. This work is related to UndercurrenT for soprano saxophone and piano. It began as an arrangement but then began to take another direction, specific to the ensemble for whom it was written. Instrumentation: Trumpet, trombone, electric guitar, loop pedals. 19 Feb 2018: at Undercurrents (Melbourne Recital Centre, Primrose Potter Salon). Featuring Ensemble Three. 29 Jun 17: International Trombone Festival, Black Box, Redlands, California. Featuring Ensemble Three.